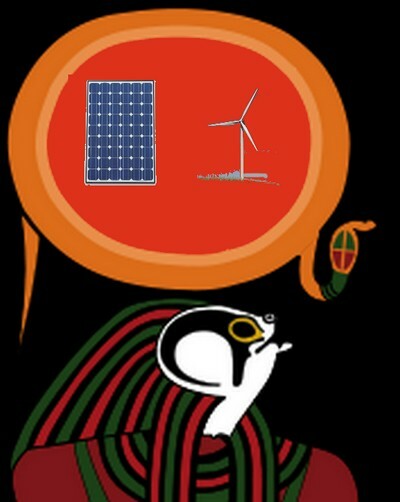 I have created an annual Amun-Ra award for heroic green energy responses to our global climate crisis. Climate change is by far the most urgent of the threats to human existence that human beings can do something about. We are moving rapidly, by virtue of our massive carbon emissions, toward a climate that may be too unstable to sustain human life. The award is named for an ancient Egyptian composite deity, since Egypt is among the countries most threatened by rising seas over the next 80 years. Amun was a god of the wind and patron deity of ancient Thebes (modern Luxor). Ahmose I (c. 1550–1525 BCE), from Thebes, led a rebellion against the foreign Hyksos dynasty based in the Delta to his north, and managed to overthrow them and unite upper and lower Egypt. At that point, the local wind god Amun was joined to the national god of the sun, Ra, becoming Amun-Ra. Since wind power and solar power are two of our great hopes for avoiding the worst climate disasters that will be brought about if we continue to depend on coal, gas and oil, Amun-Ra is a good symbol for renewables. There are many worthy activists and policy-makers in this field. Green Party figures in Germany and the present Chancellor, Angela Merkel, have made that country a powerhouse in the renewables field. Scientists such as James Hansen and Michael E. Mann have done the hard and dangerous work of demonstrating the reality of climate change. But since I can only give one this year, I decided to bestow the honor on the most ambitious practical policy-maker on the issue. 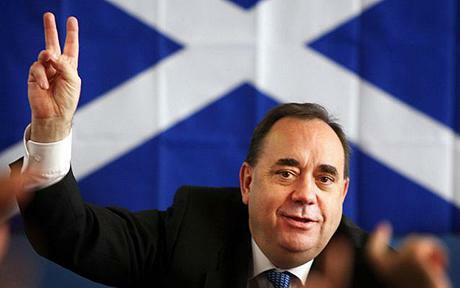 Winner: The 2012 Amun-Ra award goes the far-sighted First Minister of Scotland, Alex Salmond, one of the contemporary world’s great heroes. Scotland gets the award because it has the ambitious goal of getting 100% of its electricity from renewables by 2020, and it is making amazing progress toward attaining it. Although many provinces or countries get 60% or more of their electricity from renewables, most of these depend mainly on hydro-electic. For those without riparian resources, the challenge is to implement other renewable energy generating technologies. Scotland is favorably situated to develop wind power, and is going for it in a big way. Based on the performance of the first three quarters, Scotland was on track in 2012 to generate 15 percent more electricity from renewables than in the previous year (which also broke earlier records). In 2011, Scotland had generated 13.735 gigawatt hours from renewable sources (up 44.3% from 2010 and an increase of 97.3% from 2006). Unlike in Portugal, a relatively small portion– only about a gig — of that was from hydroelectric. Scotland is planning the world’s largest offshore wind farm. Some of the Scottish have even put in solar panels and use solar thermal to heat water. Although solar is a harder technology to profit from in overcast Scotland than wind, it can be part of the renewable mix there. The government is also now experimenting with wave energy, which could be huge for Scotland, as well as tidal energy. The UK in general is now wavering on commitment to renewables, under the Tory government of David Cameron, and national policy may hobble Scotland’s efforts a bit. BP and other Big Carbon interests (and Donald Trump) are propagandizing against wind as ruining the beauty of the countryside, as though oil rigs do not, or as though catastrophic climate change would be better. A warm congratulations to First Minister Salmond, and heartfelt thanks from this member of the small McIlwee clan (my maternal grandfather’s line) for making Scotland a leader in saving our world.